Building construction and use account for about 30 percent of global energy consumption. Sustainable construction becomes increasingly important for climate protection and resource conservation. Our products and development work contribute to both cost-effective and eco-friendly building construction and design. You're looking for an insulating material that combines top performance with economy? You want to modernize your house and need space-saving, energy efficient materials for the roof, walls and floors? You're on the lookout for a cost-effective and at the same time sustainable construction application for your customers in the construction industry? Then take a look at the BASF product range. Choose from a multitude of systems and customized products – geared entirely to your individual needs. For high-performance insulation in and around the home, you can choose from numerous materials and products from BASF. The broad spectrum of polyurethane products includes structural panels made of Elastopor® for the insulation of walls and floors, and pitched and flat roofs. These systems feature mechanical properties permitting their use in heavy-duty areas while also displaying exceptional thermal protection. They are also compression-resistant, dimensionally stable, water-repellent and therefore ideal for floors, walls and roofs. And there's one more advantage: They combine outstanding insulation values with markedly slimmer insulation. This way you not only save money spent on heating, but also precious space. Polyurethane spray foam systems like Skytite® and WALLTITE® are applied straight onto the surface. They form a continuous, uniform insulation layer without joints and gaps, thus facilitating insulation free of thermal bridges. Great insulation performance, high ecology and economy, and a broad diversity of applications are the distinctive attributes of Neopor® polystyrene granulate – the innovative refinement of classic polystyrene insulation. BASF offers expanded foam manufacturers the broadest product portfolio in the grey expandable polystyrene segment. With insulating materials made of Neopor®, designers, architects and building owners benefit from the specific advantages of this material that are decisive for energy efficiency, economy and sustainability: a good price-performance ratio, eco-efficient, successful in reference projects, greater design freedom thanks to slimmer panels, and a broad range of applications. You want to improve the functionality of windows? Then our materials are the Number One choice for the reinforcement and foam-filling of window profiles with Ultradur® and Elastopor®. Window profiles can be a weak point in building insulation. With a foam filling of Elastopor® and reinforcement with Ultradur®, the insulation value of the profiles improves while the weight -keeping all mechanical properties - falls appreciably. Do you have a desire for greater luminosity in your home and thus larger windows? They require stronger frames and need to maintain their functionality and appearance over their foreseen lifetime. Suitable stabilization is therefore crucial. BASF’s wide range of light stabilizers for PVC and acrylic film allows you to tailor your formulations to ensure that window profiles laminated with such films fulfill life expectancy requirements. For the sanitary and water industry, we have developed products that make life more pleasant and less complicated. Comprising of heavily stressed parts in the sanitary sector or components coming into contact with water in coffee makers, we've got solutions of the first water in the shape of Ultraform® and Ultradur®. And you can also find us in places where you won't see us at first glance, i.e. in water meters or fittings containing internal elements of Ultramid® or Ultrason®. Plastics are also used in applications such as swimming pools where they are exposed to sunlight and various chemicals. The presence of halogenated flame retardants can also be detrimental. Each case requires specific development and performance evaluation. This entails extensive technical expertise and a clear understanding of testing methods. Each material used for membranes has its own challenges. While TPO membranes need to incorporate process, thermal and UV stabilizers to protect them during manufacture and use, numerous PVC membranes are stabilized with high amounts of TiO2. Adding UV light stabilizers allows to reduce the TiO2 content, ensuring less wear-and-tear on processing equipment and more vibrant colors, achieved with lower amounts of pigments. Dowels of Ultramid and thermally separated holders display impressive strength, toughness and simple processing. And since we can be found in all areas where intelligent applications are involved, we also have the Elastolit® PU system for imitation wood and stone. This way, you can combine the appearance of a natural material with the advantages of a robust plastic, indoors and outdoors. Indoors, there's also plenty that we can do for you. Thanks to its high sound absorption, Basotect® is the ideal material for sound absorption in buildings. And in the event of a fire, Palusol® fire protection panels prevent the spread of fire and smoke to other rooms for a defined period. Our portfolio for the construction sector not only enhances safety, but also helps to cut costs and ease the burden on the environment. And with the novel high-performance insulating materials SLENTITE® and SLENTEX®, we show how the future of insulation can look. Customized climate management for the highest expectations. So that the architecture of tomorrow can be creative, cost-effective and sustainable. SLENTITE® is a new high-performance material for customized climate management. Sustainability and intelligent use of resources are core subjects of the future. Efficient insulation plays a key role in this discussion. Due to new chemical formulas BASF has created an organic PU aerogel as a ready-to-use panel for the insulation sector. With the support of BASF's solutions for sustainable construction, a pilot project is being realized in Mexicali, Mexico. Given the extreme climate conditions in this region, Mexicali struggles with high energy consumption. The main goal of BASF and its project partners URBI Vida Residencial and Lean Housing Consulting was to reduce energy consumption by 30 to 40 percent without compromising on the level of comfort for the residents. 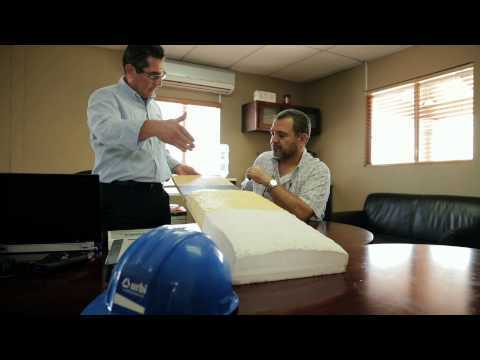 Roberto García Contreras, National Construction Manager at URBI, describes BASF's contribution to the success of the project: For exterior walls Neopor>sup>® insulation was used, Thoro Stucco® was applied for interior walls to increase durability and reduce maintenance. On roofs Elastopor® was used as insulation material and Master Seal® for waterproofing.